Ninety degrees, no breeze and humidity so think you could cut the air with a knife. The house full of the plasterers/painters which means you and the boys can’t be there, relaxing and enjoying the two wimpy window air conditioners that try to cool your little house. Your choice? Drag them all off to the Minnesota Valley National Wildlife Refuge, of course. A brilliant move, at first. The newly reopened visitor center was cool and full of interesting stuff. Happy boys watched birds at the the feeders outside the window, checking out the exhibits and asking a million questions. Should we go for a hike? YES!! We started off okay. We checked out a backpack full of goodies and picked a shady trail. 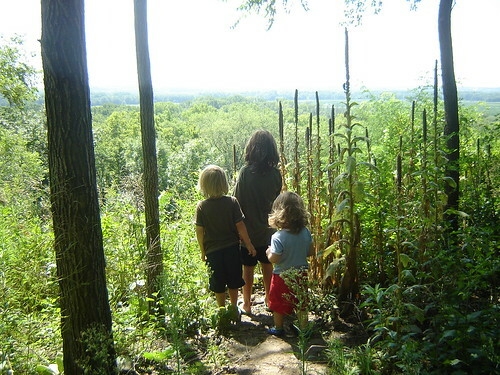 We enjoyed the view, and set off into the woods. And then what shall forever be known as the Great Compass Battle of 2010 broke out. The boys were hot, tired and the mosquitoes had found us. 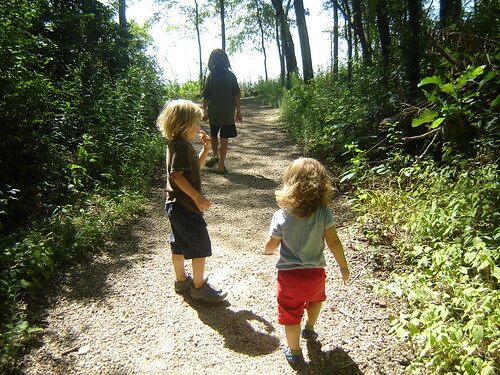 Their mama was dragging them off into the woods and now it was discovered that there was only ONE very awesome thermometer/compass in the backpack. And it had a clip to hang it on your belt loop. If you know boys, you know that there is nothing better than something that can be clipped onto your belt loop. And that is how just two minutes later this peaceful hike turned into bloodcurdling shrieks in the middle of the forest. Math Boy gave in right away, realizing it just wasn’t worth it and went to look for snakes. Knittykid and Spinner fought to the bitter end when I was finally able to convince Knittykid that there was no possible way his little brother would ever give in (he is almost two, after all, and he bites) He tramped off in a huff. We made it another 50 yards or so and at that point I realized this was not the day and wisely convinced them to head back for and early lunch. We ate and headed back into the city to play with friends and nap in a shady park. Reminder for the day to myself: don’t push it mama! Not every adventure will be an idyllic outing and that’s okay. No sense in forcing what’s not meant to happen. Enjoy the little moments and move on to something else. Your day will be the better for it! I’ve been there. 😉 It seems like extreme heat can bring out the worst in everyone. I hope that today goes a little better. Sometimes the only answer for a day like that is some water and a shady place to nap. Lakes, kiddie pools, sprinklers. I used to live in NY…and do remember what “muggy” is, add a few kids to the mix- that can be a a tough one. We were always parked at the lake in summer or the pool…really was the only thing to keep us sane + icecream…lots of ice cream. Looks like a beautiful place to go for a hike, but you were wise not to force it…at least you didn’t have to endure a good chomp before revising your plans! Also, probably better pick up another one or two of those water bottles, huh? Well the first part sounded good – shame about the hike. Hot weather does make me rather cranky, too.